near the center is a brown sea urchin. NBC's Jim Miklaszewski reports on the Pearl Harbor anniversary and the undersea expedition that has yielded new insights. 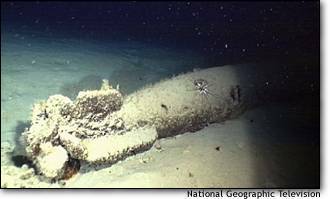 WASHINGTON, Dec. 7 -- A midget Japanese submarine rests on the sea floor outside Pearl Harbor, a remnant of America's sudden introduction to World War II and a reminder of missed opportunity. American forces might have had time to prepare for the Japanese attack on Dec. 7, 1941, if higher command had heeded the warning from an American ship that discovered tiny subs trying to enter the harbor and attacked them, undersea explorer Robert Ballard said Thursday. BALLARD HAS BEEN working near Pearl Harbor for a television special planned to air in May. He chose the anniversary of the attack to discuss his sea floor discoveries, including the midget sub, tanks, airplanes and an "incredible" amount of ammunition. "Most people don't realize that the first shots fired in the war of the Pacific were by us," Ballard said in an interview. It was 45 minutes before the Japanese aircraft attacked that a U.S. destroyer, the USS Ward, dropped depth charges on a midget submarine that was trying to sneak into the harbor behind a tugboat. The Japanese submarine's job was to enter Pearl Harbor and attack U.S. Navy ships in conjunction with the arriving Japanese airplanes, he explained. "The people on the tug saw the periscope, alerted the Ward, and the Ward came over an engaged it," he said. "Ironically, they reported it, but no one pushed it up the chain of command. Just imagine what a totally different outcome it would be if we'd gotten a 45-minute warning," Ballard said. As it turned out, the 360-plane Japanese air attack struck an unprepared U.S. base, sinking or severely damaging 18 ships, destroying 200 aircraft and killing an estimated 3,700 Americans. Decried by President Franklin Roosevelt as "a date which will live in infamy," the attack brought the United States into World War II. "Just imagine if they had heeded that warning and had 45 minutes to get ready before the Japanese came ... it would have been a very different day," Ballard said. Ballard's television special is scheduled to air in May on the National Geographic Channel, a new cable channel being launched nationwide in January. Ballard brought veterans of the battle back to the scene -- one Japanese man who had served on a submarine that helped launch the midget subs and two Americans who served on the Ward. "There is something about bringing these adversaries back together 60 years later, and all of a sudden the memories, they remember things that they thought they'd forgotten," he said. "We had a Shinto ceremony out there ... it was very tearful." Beneath the sea, he said, "We found a museum down there: fighter planes, a Hellcat, seaplanes, we found tanks, landing craft, one midget submarine, parts of another, and the deep sea preserves it." The artifacts were all American except for the midget submarines and a few torpedoes, he said.